Space is limited - Don't wait to register early! Early Bird Ticket Pricing: ONLY $65 for a FULL DAY of learning and more! *Early bird ticket pricing is valid through July 1, 2019. REFER / BRING a friend with you for $10/off that price! *See details below on how to redeem and refer/bring someone. Conference Description: Do you have questions? Bring them! We will have answers! 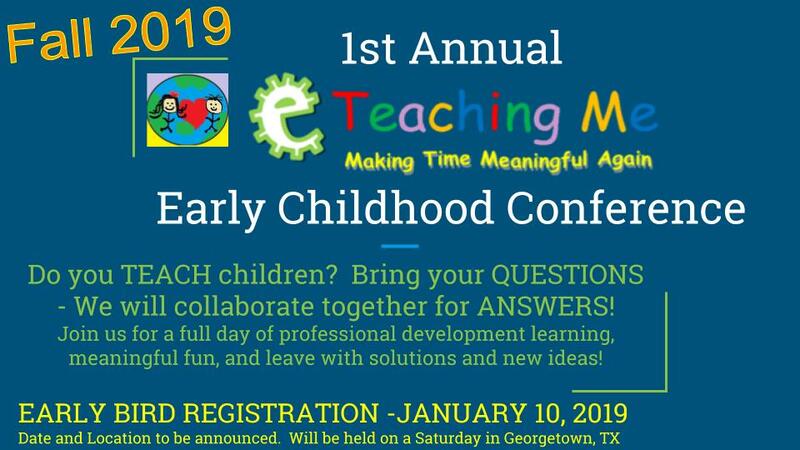 Join us for our 1st Annual Early Childhood Conference in Georgetown, Texas to earn your CEU hours and have fun! This conference will be like no other you have attended. We will combine real-life problems and scenarios you experience daily in your profession working with young children, and we will collaborate together to apply solutions for your benefit to begin implementing right away after the conference is over! The conference is organized around 4 Q/A session topics: Behavior Management, Connecting with Parents, Health and Safety, and Curriculum Planning. Our conference goal is to serve you by answering your questions, so when you leave you can feel confident and successful to begin implementing the new ideas into your profession right away for the kids you love. Additionally, we will provide you with important facts, key information on the benefits of play, tips and tools, and a whole lot of fun to help you understand the social and emotional developmental milestones in young children by our licensed professional family therapist, closing keynote speaker! We will also have vendors set up for fall shopping during designated breaks! You will WANT to attend, to get help for all of your NEEDS! We can't wait to see you in September! Cost: Regular pricing $75 per registrant (early bird registration $65 until July 1, 2019). Referral discount: $10/off your ticket price (limit 1 referral per attendee). You have to be registered 1st in order to refer/bring someone with you. Once you have registered yourself, please send this registration form to the friend you want to refer/bring with you. When they register, they will list your name as the referee in the form. Then, you will receive $10/off to your ticket price. The person who referred you can also refer/bring a friend and then they would receive the same discount. The more, the merrier - sharing is caring and that is why the discount giving will keep on giving to each person who shares the word and brings a friend to join them! A great education to help lead our children takes a village, let's create it together! Cost includes: 6 hours of CEU professional development hours (certificates will be provided at the end of the conference day), all-day complimentary coffee, juice and breakfast, afternoon dessert, all training materials and supplies, and a 6-month free subscription account to our online, engaging curriculum for you to use with your students in your class! * WHAT A DEAL for a full day of fun learning - that's our mission - cost effective, efficient services.